Finisar introduced a 400G QSFP-DD LR8 and FR8 transceivers, a 400G QSFP-DD active optical cable, a 100G serial QSFP28 transceiver, and two 50G SFP56 transceivers. The rollouts were featured in a series of demonstrations at OFC 2018. The QSFP-DD (Quad Small Form Factor Pluggable Interface Double Density) module form factor provides an eight-lane electrical interface, compared to traditional single or four-lane interfaces, thereby increasing bandwidth, channel capacity and port density. Finisar' 400G QSFP-DD LR8 transceiver uses 50G PAM4 technology. It offers a 10km reach over duplex single mode fiber (SMF). In addition to the 10km LR8 module, a 2km FR8 variant of this module will also be available from Finisar, primarily for intra-data center applications. Both the LR8 and FR8 modules leverage DML transmitter technology, providing a low power, low risk, cost-effective solution for 400G. Finisar is introducing the industry's first 400G active optical cable (AOC) in the QSFP-DD form factor. It uses VCSEL technology to achieve the low power dissipation and low cost structure. Finisar is introducing a 100G serial FR transceiver in the popular QSFP28 form factor for inter-data center, transport and router applications with 2km reaches. While leveraging a standard 4x25G electrical interface, so that it plugs into standard QSFP28 slots, this module employs just one serial 100G PAM4 optical channel. Once deployed in sufficient volume, it is expected to replace existing 100G QSFP28 CWDM4 modules. Finisar also plans to introduce a 500m DR version of this module. Four of these FR or DR modules will be able to be used in a fan-out configuration with an IEEE standard 400G DR4 module, thus providing both 100G point-to-point and 100G-to-400G fan-out connectivity at 100G per lane. The module transmits data over 2km of SMF. Finisar is also introducing the industry's first 50G SFP56 SR and LR transceivers, using serial PAM4 technology. Primary applications for these products include server-to-switch and switch-to-switch 50G Ethernet connections, and future 5G wireless applications. 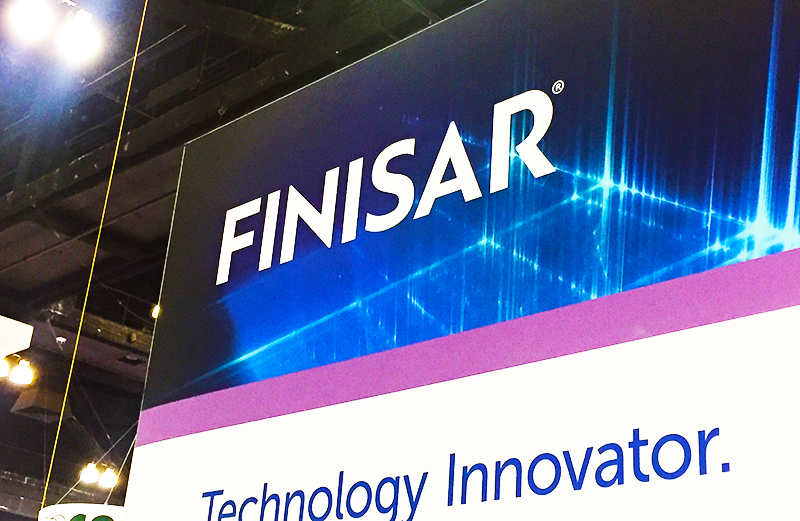 During OFC, Finisar demonstrated the SFP56 SR module transmitting over 100 meters of OM4 multi-mode fiber (MMF), and the SFP56 LR module transmitting over 10km of SMF. The modules use Finisar's in-house vertically integrated optics and ICs. They provide interoperability with previous generations of 25G SFP28 and 10G SFP+ optical transceivers. Both modules comply with the corresponding 50GBASE-R specifications as defined in the IEEE standards and offer 50G PAM4 electrical and optical interfaces. "Today, we have established a number of industry first optical modules that will enable Finisar to maintain its leadership position for the next generation of products," said Rafik Ward, Senior Vice President, Global Marketing at Finisar. "Building upon 30 years of success, we are gearing up for a new era of optical interfaces that will be built on 50G and 100G PAM4 technology. This will enable us to deliver unprecedented bandwidth to customers in form factors that are backward compatible with industry established footprints.